Take control & stop discomfort with a soothing approach! Skin damage and even scarring can occur during an outbreak because of your immune system targets and destroys infected skin cells. Herbs like Calendula, Chickweed and Comfrey are traditionally used to support the body in the skin healing process. I just want to thank you for this product! It worked amazing. It was actually the only thing that worked! It was recommended by my local natural food store in Dade City, FL. So, thank you, thank you, thank you! Poke, Arnica, Willow. St. John’s Wort, Comfrey, Lavender, Chaparral, Lemon Balm, Passion Flower, Meadowsweet, and Humic Acid. 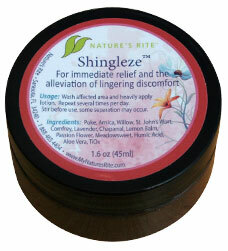 If possible, use Shingleze™ sooner than later- in the first two weeks of the occurrence. Apply every 4-6 hours. Shingleze™ is a thin topical so it will be absorbed quickly. I developed the Shingleze Product 7 years ago. Since then, I have improved it two times. This most recent improvement is the most dramatic enhancement yet. We have added Humic Acid (a derivative of soil) that attracts and immobilizes things. This is very important during the outbreak. Inhibiting replication is extremely important. For those who have the tremendous lingering nerve discomfort, you will be glad to know that I have added two more herbs to help the body relax and quiet over-active nerves. I don’t want you to have to rely on drugs. Hundreds of thousands of people just like you have sworn by the benefits of earlier versions and now that there is Nature’s Rite Shingleze™, you can find help from a highly-refined formula that is more soothing and beneficial than ever before. The cheap imitations can’t even come close to the capability of Nature’s Rite Shingleze™.